There are over 14,500 mopeds and scooters on this island and for most people it is the cheapest, easiest and most convenient way to get around. However it is certainly not the most safest. 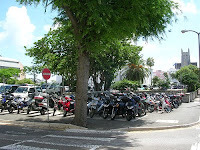 In 2008 17 people were killed from motorcycle accidents in Bermuda, which is ranked among the worst of the world's developed countries for road fatalities. We own a Vespa, but I have never taken it beyond our drive, my jaunty-other-half uses it periodically, and ridden sensibly with care and concentration they can be exceptional fun. However some riders on the narrow roads here abuse their right to live by riding like maniacs, specifically the local young Bermudians. I watch them ride side-saddle, texting whilst they are riding, riding side by side having a chat, undertaking, overtaking on blind bends and worse. Fcuk them, I don't care how cheap their lives are, but it is other road users and pedestrians I care about. In eleven years 117 people have lost their lives from road fatalities in Bermuda. This year's count of 17 equates to 23 per 100,000 people, which is among the worst in the world. By comparison, Malta had 3.2 deaths per 100,000. Extrapolate this year's Bermudian road deaths out to the UK population and it would equal 15,000 people killed from accidents mainly involving scooters under 150cc (the max size allowed). Blimey that would get the Daily Mail going. But what are the government doing about it? Not much it appears, a lot of bluster, some blithe sincerity. Some policemen on the roads would be good, particularly late at night. Sod pulling vehicles over in the morning checking licenses and dishing out parking tickets, how about speed cameras and sobriety checks. The drink driving here is shocking. There were 41 crashes alone in the week of Christmas. Perhaps the Police Commissioner George Jackson might put it top of his 2009 agenda, his son died on Christmas Day, the 16th victim of this deadly year. And then on Friday, just the 9th day of 2009, another young person died after hitting a parked car in the early hours of the morning.